These pages are dedicated to all the residents of West Wickham and Hayes in the South East Region of Kent. Oral History is supported and sponsored by clubs and businesses in the local community. The Friends of West Wickham Library ensure personal details of those wishing to become involved are kept private unless otherwise stated. The properties known as Coopers Cottages are brick and flint and date from the 1800s. They can be found just past the cross-roads between the Croydon Road and Baston Road. 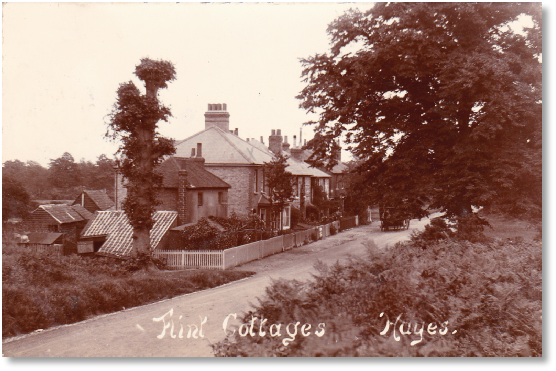 The rear gardens back onto Hayes Common, and the cottages are about one mile Hayes Station. No further cottages have been added since they were originally built and today look the same as these turn-of-the-century pictures. Around 1800 a Richard Lander applied and was given permission to build a cottage along this road. In 1816 the cottage was owned by John Cooper and by 1825 three cottages had been built. 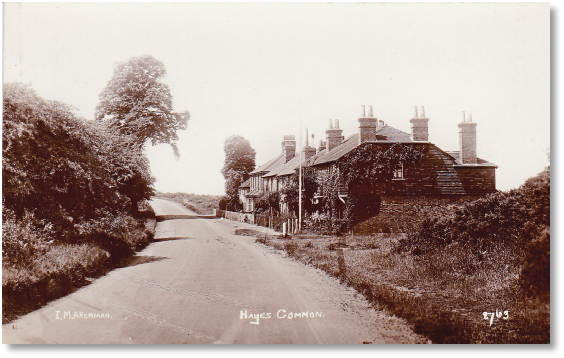 Two further owners by the name of ‘Cooper’ (unrelated) lived there at one time, and in subsequent years the site was developed and formed the group now known as Coopers Cottages. During World War l many young men from Hayes enlisted. A George Beavis who lived in one of the cottages became a signal man on Torpedo Boat No.88. Walter Cole who also resided there joined the Special Police and then volunteered for the services.